Maximum Hoof Power OOP, Now what book do we use? We have been using the book Maximum Hoof Power as a reference for the Canadian Pony Club for as long as I can remember. The content is clear, concise and fits our needs perfectly! We are updating our reading list this year and since it is out of print, I’d like to know if you can recommend a book to replace it? Maximum Hoof Power was originally published by Macmillan Publishing in 1994 in their animal imprint division called Howell Book House. Shortly after the book was released, Macmillan Publishing was acquired by Simon and Schuster (also 1994). Then the Howell Book House imprint was acquired by John Wiley and Sons in 2001. Along the way, many of the animal titles went out of print. Trafalgar Square released a paperback edition of Maximum Hoof Power in 1999 which was available for several years until it too went OOP (Out of Print). To get the hoof information back into the hands of horseowners, Richard and I worked with Storey Publishing to incorporate much of the content from Maximum Hoof Power into our new hoof book, Horse Hoof Care. It was released in 2009. I hope this book works well for you in the Canadian Pony Club. Cheap and Easy Solution for Brittle Hooves? There is an article on Cherry Hill’s Horse Information Roundup page that talks about this problem. Read this article: Dry, Brittle Hooves. We all like “cheap and easy” but when it comes to our horses’ health and comfort it usually take a considerable investment of time and money. I don’t know what products are available in the UK – use the Internet to find out. Start by searching for “Keratex hoof hardener” and “horse hoof supplements”. I’d be careful about riding a horse barefoot if his hooves are too poor to hold shoes. I suggest you get several more opinions on the horse’s feet from other farriers and vets. 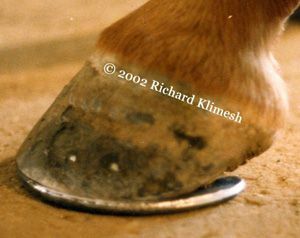 “Short shoeing”, using a horseshoe that is too small for the hoof, is one of the most common and potentially harmful shoeing errors. Assessing support can be easily done at the same time you check DP balance when you’re viewing the horse from the side. Hold the pencil at arm’s length so it lines up with an imaginary a line through the center of the cannon bone to the ground. Generally, the heels of the shoe should reach this line or extend behind it. 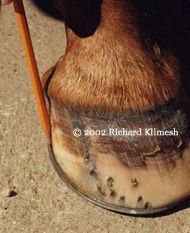 The more the heels are under-run, the farther the shoe needs to extend behind the hoof in order to provide necessary support. In many cases, egg-bar shoes or shoes with long extended heels (sometimes called “open egg-bars” because the shoes are egg-shaped but the heels of the shoe aren’t joined) are used to provide support for under-run heels. Shoes that are too short will not provide adequate support for the limb and can result in under-run heels, fatigue and permanent damage to the horse’s limbs. Unfortunately, one of the most common ways horses lose front shoes is by stepping on the heels of the shoes and pulling them off. Consequently, many horseshoers are understandably reluctant to extend the heels of the shoe (figuring it will save them a return trip to replace a lost shoe). Speed horses, especially, are likely to be shod with little or no shoe extending behind the heels of the hoof. Horses with well-formed upright hooves are better able to tolerate this compromise than are horses with lower angles or under-run heels. Note from Cherry: While I am away on business, I’ve invited Richard to blog in my stead……watch for the final part to this article series. Yee-haw ! Our fireworks yesterday for the Fourth of July was a 19 minute hail storm with hail stones over 1 1/2″ in diameter and when it was all over we had over 2 inches of hail everywhere and bigger piles where it flash flooded. All the horses were in off pasture and in sheltered pens but each and every one of them chose to stand outside in the hail ! Go figure ! But at least that tells me that next time we encounter a bad hail storm when we are out riding, they won’t freak. And that’s always a good thing. This hailstorm was brutal – the hardest hitting I have ever seen on our place. 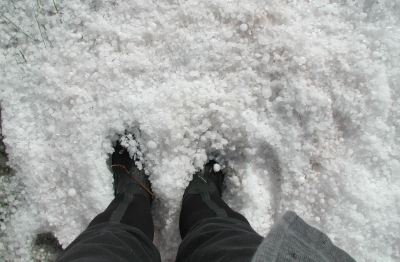 As soon as it stopped we were out slogging around in the hail – it was like walking through slimy ball bearings or tapioca pudding. When we got up to the barn, we saw the shod horses teetering on huge ice mounds. Who would have thought we’d be chipping ice balls out of the horse’s hooves in July?